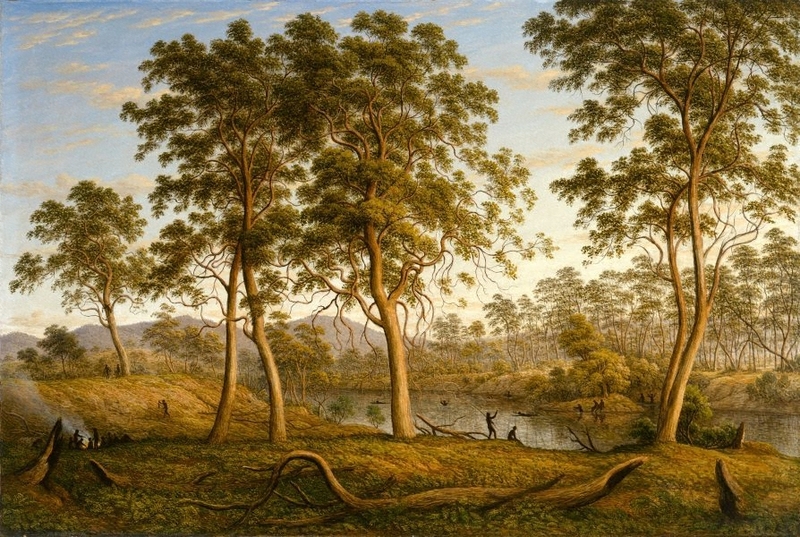 John Glover was already an established artist when he emigrated to Tasmania in 1831 at the age of 64. A highly successful watercolourist and painter of Arcadian views in the tradition of French landscapist Claude Lorrain, Glover quickly adapted his picturesque style and luminous technique to his new surrounds. One of his most subjective works, this painting is informed by European notions of an Antipodean Arcadia, with Indigenous people living in a landscape unsullied by European contact. However, 'Natives on the Ouse River' stands in marked contrast to the actual situation of the traditional owners of Ouse River country - the Braylwunyer people of the Big River nation - which was one of dispossession and violence at the hands of the colonists. Signed and dated l.l. verso, pen and black ink ".../ J. Glover 1838". Robyn Donohue, Look , 'Arcadia: Nineteenth Century Australian Photography', pg. 22-23, Heidelberg, Oct 1998, 23. Bruce James, The Sydney Morning Herald , 'The big idyll', pg. 12-13 (Spectrum), Sydney, 12 May 2001-13 May 2001, 12, 13 (colour illus.). NOTE: this article appears in Spectrum, pg. 12-13. Bruce James, Art Gallery of New South Wales handbook , 'Australian Collection: Painting and Sculpture', pg. 102-181, Sydney, 1999, 104 (colour illus.). Elwyn Lynn, The Australian , ' An eye for Glover's nature', Sydney, 20 Oct 1986, 6. Barry Pearce, Look , 'A quiet love affair: private passion over 33 years gives birth to a book', pg. 26-29, Sydney, Sep 2014, 29 (colour illus.). Barry Pearce, Look , 'A question of balance: How it is bringing changes to the old courts and beyond', pg. 28-29, Sydney, Sep 2009, 29 (colour illus.). Barry Pearce, Art Gallery of New South Wales handbook , 'Australian', pg. 13-35, Sydney, 1988, 14-15 (colour illus.). Laura Pia, Look , 'Seeing art takes more than looking: Audio description tours now at the Gallery', pg. 12-13, Sydney, Jul 2009, 13. Ursula Prunster, Look , 'Image and identity: the perennial question of Australian identity features in the Gallery's 2001 lecture series', pg. 10-11, Melbourne, Dec 2000-Jan 2001, 11 (colour illus.). Julie Roberts, Uncertain ground: essays between art + nature , 'The edge of the trees at the end of the millennium', pg. 125-141, Sydney, 1999, 129 (illus. ), 130. Joan Ross, Look , 'The art that made me', Sydney, Mar 2018-Apr 2018, 22 (colour illus.). Anne Ryan, Australian art: in the Art Gallery of New South Wales , 'Colonial eyes', pg. 17-18, Sydney, 2000, 18, 23 (colour illus. ), 300. Jill Sykes, Look , 'Barry Pearce’s next book-call it "segueing with intent"', pg. 28-29, Sydney, Mar 2012, 28 (colour illus. ), 29. Wayne Tunnicliffe and Deborah Edwards, Look , 'New Australia', pg. 24-27, Sydney, May 2012, 25. Vivienne Webb, Look , 'Colonial perspective', pg. 22-23, Melbourne, Apr 2001, 22 (colour illus. ), 23. 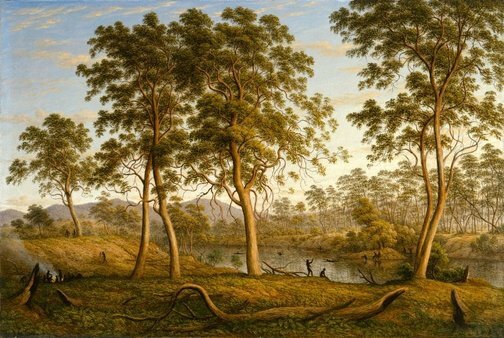 Vivienne Webb, Australian Collection Focus: John Glover Natives on the Ouse River, Van Diemen's Land 1838 , 'The Woods of Arcady are dead...', pg. 2-6, Sydney, 2001, front cover (colour illus., detail), 2-4, 5 (colour illus. ), 6-8. Judith White, art lovers: the story of the Art Gallery Society of New South Wales 1953-2013 , 'Chapter 3: Changing of the guard 1972-1979', pp. 65-84, Sydney, 2013, 70. Judith White, Look , 'Olympians of Australian art', pg. 16-18, Melbourne, Jul 2000, 17 (colour illus.). Anne Woodham, Look , 'Location, location, location', Sydney, Nov 2016-Dec 2016, 22 (colour illus.). AGNSW Collections , 'From Colonialism to late Modernism', pg. 7-106, Sydney, 1994, 10 (colour illus.). Art & the West , 'Destruction & creation: The frontier', Sydney, 1987, (colour illus.). AUS 2 card. Art and Australia (Vol. 23, No. 2) , Sydney, Summer 1985, 190 (colour illus.). The Australian financial review , '$2,000 per native - one way of pricing a Glover', pg. 36, 42., Sydney, 21 Mar 1974, 36. The Australian financial review , 'Cattle in a swam, p -, Sydney, 14 Mar 1974, 30. A history of Hamilton, Ouse and Gretna , Launceston, 1963, (illus. ).